The Lucky Reptile Bright Sun Set range contain all you need to set up these revolutionary metal halide lamps in vivariums and are a real plug 'n' play solution consisting of a metal halide lamp, electronic ballast/starter and high temperature-rated ceramic holder. 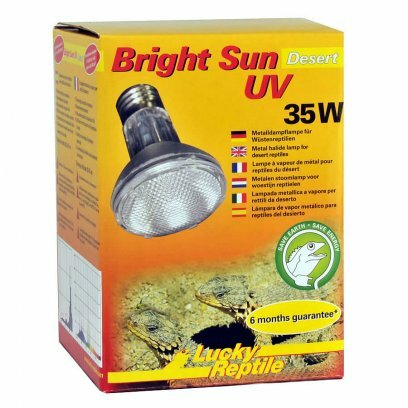 These lamps have been specially developed for use with reptiles and provide very high levels of light and UVB without excessive heat. As with Mercury Vapour lamps they cannot be used with a thermostat, so care needs to be taken to select the appropriate wattage and installation for the enclosure to prevent over-heating. 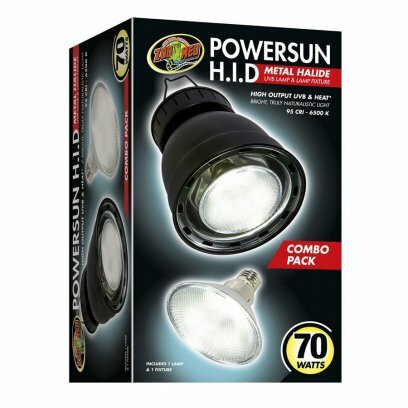 They are available in 35W, 50W and 70W in both Jungle and Desert versions all at the same great price. 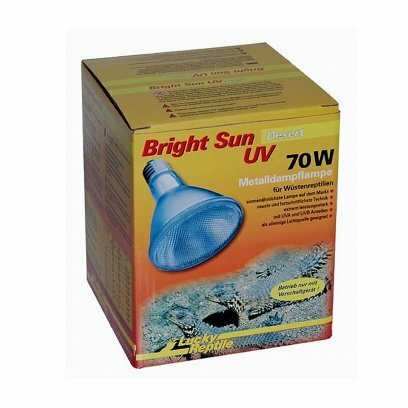 The Bright Sun UV is a revolutionary new UV lamp that offers light, heat and UV in one lamp at low wattages. 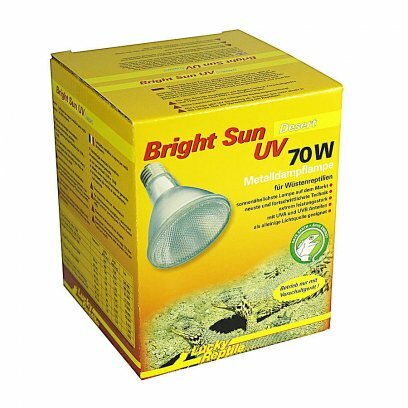 A Bright Sun UV Desert 70W offers heat and UV output comparable to a 160W mercury vapour based UV lamp but its light output is 5 times higher! This is especially important as it was impossible till now to recreate natural lighting conditions inside a terrarium. In nature a light intensity of 100.000 lux and more exists on a sunny day. Especially with desert species a high light intensity is beneficial for the well-being and will influence activity and colours of the animals. While the Bright Sun UV Desert 70W still cannot match the power of the sun with 60.000 lux at 30 cm, it is far ahead of mercury vapour UV lamps (approx. 10.000 lux), fluorescent lamps and incandescent lamps. The base for this high light output is the energy efficiency of the lamp. Most of the energy is converted into light while with incandescent lamps 95% of the input power is turned into heat. 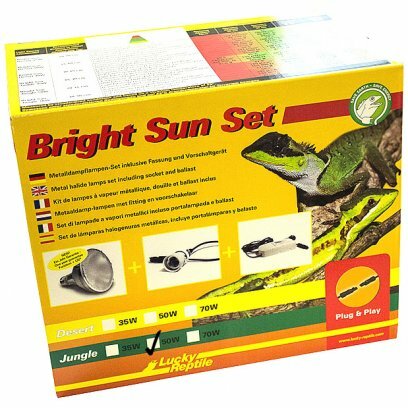 The low heat loss of the Bright Sun lamps allow the use even in small vivariums. An effective reflector construction ensures that almost all created heat is concentrated inside the light focus. The lamp is therefore able to create warm basking areas. The spectrum of the lamp is optimized for desert reptiles. Research and tests have shown that reptiles from desert regions prefer a daylight spectrum with a colour temperature of 6000K. This is achieved by the Bright Sun UV Desert. In combination with its heat, UV output and high light intensity the Bright Sun UV is practically a small sun for vivariums. Average life is 6000h, we recommend changing lamps yearly though to provide always the best lighting possible to the animals as the spectrum will change over time. This is typical for metal halide technology and also dependent on the type of ballast used. Also UV and light output will continually decrease over time. The Bright Sun will fit into standard E27 porcelain lampholder and requires a ballast like the Lucky Reptile Bright Control devices. It is possible to upgrade existing terrarium lighting setups that use E27 lampholders. 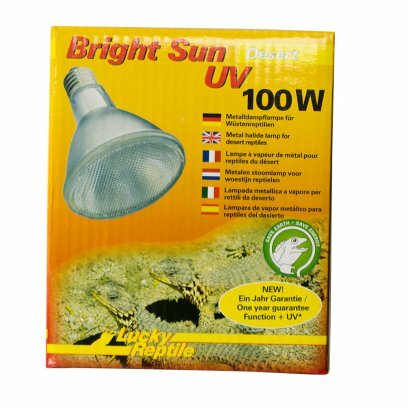 High output UVB and Heat Lamp and fitting Combo pack for use with larger enclosures. 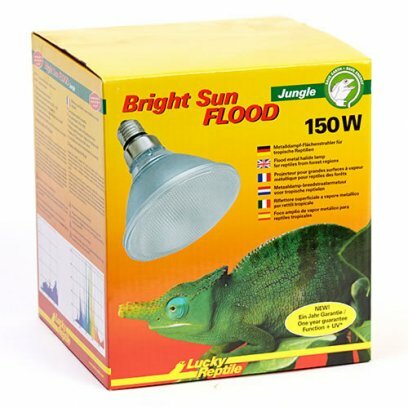 A true flood lamp with no UV hotspots giving a sun-like bright and natural looking light. UVA, UVB and heat all from one lamp. This combo pack contains both the lamp and fixture. 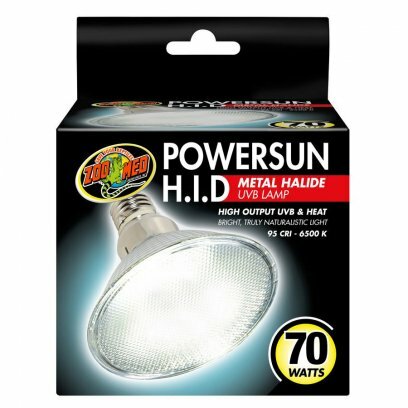 Specially designed fitting for use with the Zoo Med Powersun HID metal halide lamp. A true flood lamp with no UV hotspots giving a sun-like bright and natural looking light. UVA, UVB and heat all from one lamp. High output UVB and Heat Lamp for use with larger enclosures. 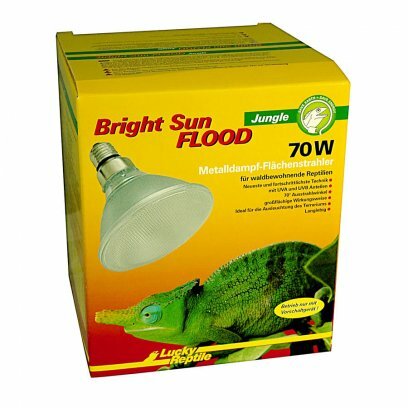 A true flood lamp with no UV hotspots giving a sun-like bright and natural looking light. UVA, UVB and heat all from one lamp. 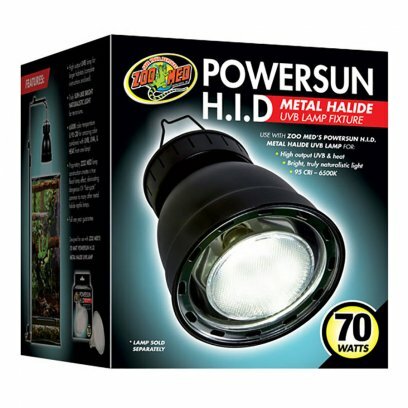 This lamp can only be used in the Zoo Med Powersun 70W HID fitting or with an appropriate ballast for a 70W metal halide lamp. The Bright Sun UV Jungle was developed especially for reptiles from tropical and forest regions. It has a slightly lower UV performance than the Bright Sun UV Desert taking the different conditions in the natural habitat of these animals into account. Branches and leaves filter quite a lot of UV, so the animals do not experience the full intensity of the sun. In addition it has to be considered that arboreal animals will usually be able to get quite close to a lamp inside a vivarium. Since UV radiation is potentially dangerous and the UV intensity is at 10 cm distance 5 times higher than at 30 cm, we have consciously reduced the UV output. The spectrum was adapted to the natural conditions of forest regions. With 4000K the colour temperature is warmer than the daylight of the Bright Sun UV Desert. Tests have shown that tropical lizards like water dragons prefer the warmer light of the Bright Sun UV Jungle over the daylight of the Bright Sun UV Desert. The warmer light of the Bright Sun UV Jungle will also promote the colours of plants causing a nice forest ambiance inside the vivarium. The Bright Sun FLOOD was developed as an alternative to metal halide flood lamps and ensures a large scale illumination of the terrarium thanks to a 60 dgree reflector. The lamp offers UVA and UVB radiation as well as a certain heat output. 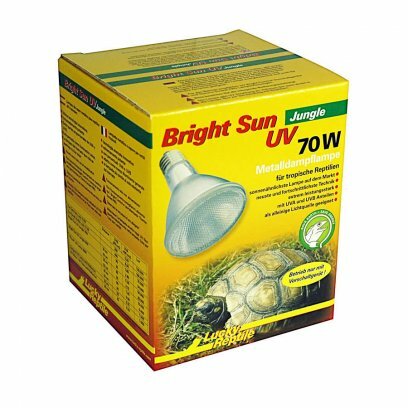 Thanks to its wide reflector the Bright Sun FLOOD Jungle ensures a large scale illumination of the terrarium and has a lower UV and light output than a Bright Sun UV. For a lot of forest dwelling reptiles this is an advantage as many avoid direct sunlight. Most chameleons for example belong to this group. For these animals the Bright Sun FLOOD Jungle is the perfect lighting and can be used as a sole lamp as these species do also have lower UV requirements. For sun loving animals like Green Iguanas we recommend the combination with the Bright Sun UV Jungle to create local basking sites. 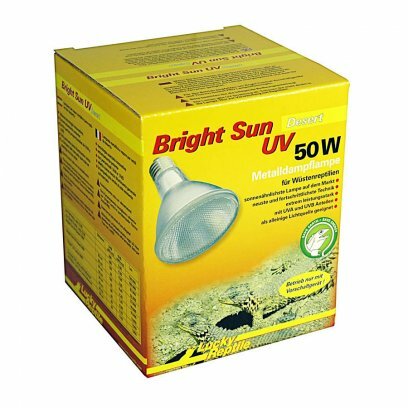 The Bright Sun ULTRA is a high performance lamp which was developed for use in large terrariums. It is necessary to keep a minimum distance of 50 cm to the animals. At this distance temperatures of over 50°C can be achieved. Thanks to a special reflector construction a part of the light output is bundled in the middle of the light cone achieving a good UV and heat performance. The rest of the light is widely distributed to achieve a good illumination of the terrarium. 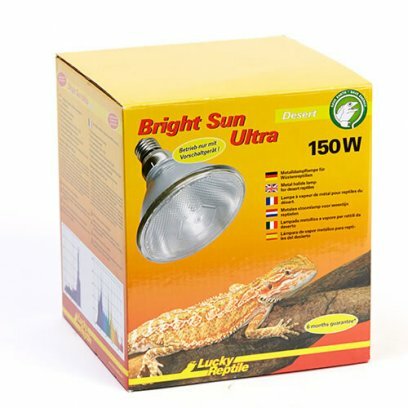 The Bright Sun ULTRA Desert is a unique hybrid lamp that perfectly fits to the requirements in large vivariums. 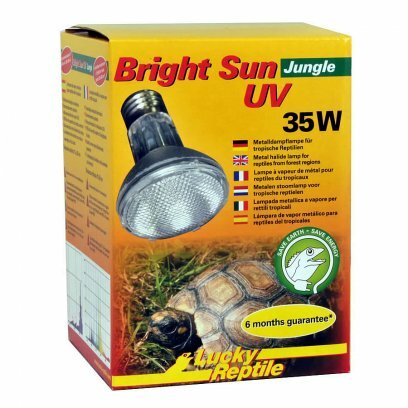 Combined heat and UV's provide the perfect basking spot for turtles, tortoises and many reptiles. 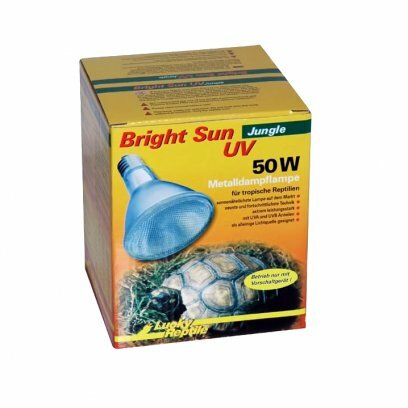 These powerful bulbs are most commonly used over tortoise tables or a turtles basking spot but can be used in larger vivs to provide another source of UV.